Barcelona is a popular destination, and you don’t want to find there aren’t timed tickets available for Gaudi sites during your family visit to Barcelona. Gaudi’s Sagrada Familia is one of the most visited monuments in Spain. Be sure to get timed entry tickets for a specific date and time well in advance. The general ticket provides entrance to the basilica and museum. In addition to the basilica ticket, buy a Tower ticket (minimum age 6 years and up, best with older kids). This allows you to take an elevator up one of the towers, then walk all the way down a spiral stairway, coming out at the bottom inside the church. From the top are stellar views of adjoining towers and mosaic decorations, and really gives kids a sense of the immense height of the towers. Before going up the elevator, check backpacks and large handbags in lockers. On the spiral stairway section, hand railing is on one side only, and there few landings to stop and let people go by while walking down. When we visited, the Tower ticket was elevator up and walk down only (you couldn’t ride the elevator up, take a look, then ride the elevator back down). Dress code for the Sagrada Familia – no sleeveless tops, short skirts, short shorts, or hats in the basilica. Bring binoculars to look at the details of the Nativity Facade, the towers and interior of the church. Read our blog post “A Visit to Sagrada Familia in Barcelona” to become familiar with what’s portrayed inside and outside the basilica, and appreciate the inspiration from nature and symbolism of Gaudi’s designs. Barcelona is a great walking city, but also spread out, so use the transportation network, including metro (subway), trams, buses, and funicular to Montjuic Park. The metro is the fastest way to get from one part of the city to the other. Here’s the metro map. It’s easy to buy metro tickets – ticket kiosks are multi-language, just select the English icon. It’s convenient to buy a day ticket for unlimited travel, or get a card with 10 trips on it (every time you use it, it will display how many trips remain on the ticket). To get oriented before exiting the subway, take advantage of maps showing exactly where you’re located, different street exits, and connecting buses or trams. Tip: Your ticket is also good for the funicular that goes from Paral.lel stop up to Montjuic Park (Parc de Montjuic) – see more information below. Montjuic Park is a large park located on a steep hillside above Barcelona. To get to the park, buses and taxis are available, but the most fun way is to ride the cable cars (telefericos) and funicular. Funicular de Montjuic goes up to Montjuic from Paral.lel metro stop to Avinguda de Miramar. At the funicular station, it’s walking distance on Avinguda de Miramar to the Fundacio Joan Miro and other museums. When you exit the funicular, you’ll see cable cars of the Teleferic de Montjuic, zipping up the hill to Montjuic Castle. Buy a separate ticket for the teleferic. No need to buy a round trip ticket, kids will have fun walking down, there’s a playground and picnic tables along the way. Aeri de Port (Teleferico del Puerto) – From Torre de Sant Sebastia in Barceloneta, take the cross-harbor cable car to Placa de L’Armada on the southeastern edge of Montjuic Park. The views across the harbor are panoramic, but the ride is more expensive, departure and end points are not as conveniently located for further sightseeing in the park. Individual streets are well marked in Barcelona, but look for additional blue street signs, highlighting touristic sites. The blue signs are particularly helpful in the old city with narrow streets and tall buildings that look similar – it’s easy to get turned around. So for example, in the photo above, if you’re walking on Carrer de la Princesa, these blue signs indicate that to the left direction is Carrer de Commerce and Chocolate Museum (Museu de la Xocolata), Passeig de Picasso for Parc de la la Ciutatdella (City Park); to the right is Via Laietana and Jaume I metro stop, Carrer Montcada for Picasso Museum (Museu Picasso). Barcelona has fabulous covered markets, with large variety of fresh fruits, vegetables, cheese, eggs, seafood, fish, meats, fruit drinks, chocolates, pastries, prepared take-out food, and casual eateries where you sit on stools and have a tasty meal or snack. If you’ve rented an apartment, these markets are perfect for food shopping. Mercat del Ninot (Eixample west) is one of our favorites, and it also has a full size Mercadona supermarket at the lower level, also Mercat de La Concepcio (Eixample east). In the old city are La Boqueria (Mercat Sant Josep), Mercat de Sant Antoni, Mercat Santa Caterina (Santa Caterina is less crowded than La Boqueria). These markets are closed on Sunday, so do any weekend shopping on Saturday. Tip: The department store Cortes Ingles, located at Placa de Cataluya and Avinguda Diagonal 471, has a supermarket on the lowest level, open daily. So many fun things to do in Barcelona, you’ll need a fun place to stay. 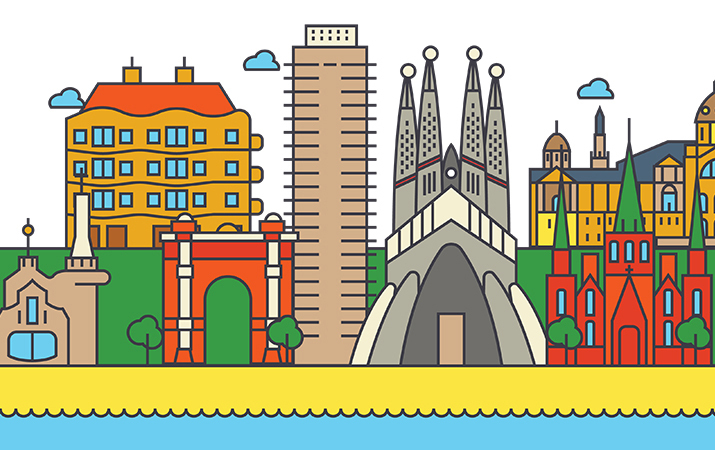 Check out Travel for Kids hand-picked list of Barcelona family hotels. Hotels are selected for their amenities for families, such as swimming pools, proximity to restaurants, supermarkets, cafes, laundromats in the neighborhood, mini-fridges in rooms, babysitting services, playground close by. Barcelona family apartments rentals have lots of advantages for families – a kitchen and refrigerator so you don’t need eat all your meals in restaurants, room to spread out all your stuff (kids can have a room of their own), and cost savings for larger families. Apartment rentals are selected for their amenities, such as apartments that sleep 4 – 8, washer and dryer, proximity to markets, short stays are available.